The elegant-sounding Elysian Viaduct is actually just a 1.5-mile-long overpass connecting downtown Houston with the Near Northside. The downtown-side entrance to the overpass is just north of Minute Maid Park. The overpass was built in 1955, over what had been Elysian Street, without taking any adjacent properties. As shown in the photos above, the overpass was thus built almost on top of homes in the historic neighborhoods it crossed, contributing to the decline of those neighborhoods. A proposed expansion and extension of the viaduct poses a new threat to the Near Northside, which features one of the city’s largest concentrations of late Victorian architecture. 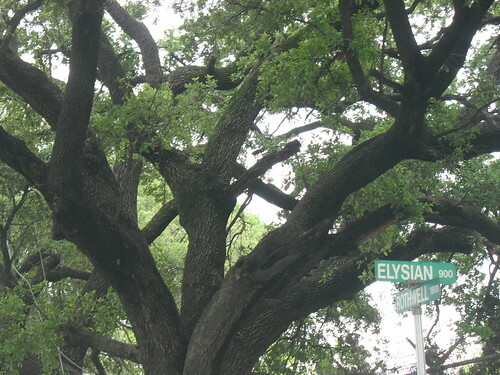 Davis, R. and Walton, R., Editorial, “Let’s not remake the same mistake with Elysian Viaduct,” Houston Chronicle, Dec. 6, 2004. This entry was posted in Downtown, Transportation. Bookmark the permalink.